Wake up in the morning neither to the shrill of your alarm clock nor a noisy rooster but the resounding roar of a lion! Africa’s safaris promise a thrilling experience like no other. Among the captivating scenes and scenery, one epic journey stands out. 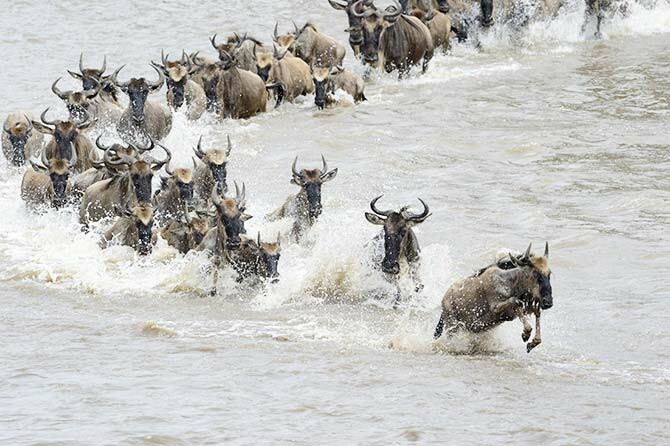 Every year, the wildebeest, zebras and gazelles embark on a grandiose migration. The road is beset with danger, with many predators lying in wait. In the plains, the lions and leopards prowl about while the crocodiles lie hidden in the river. In fact, the chance of seeing a lion make a kill is a big draw for many travellers to the area. Many wait out in camps patiently and anxiously to catch the right moment. Join a camp to follow the great migration across the Serengeti plains or hire a guide to bring you around. Nonetheless, it is important to always maintain a safe distance from the “big five game” – the African elephant, lion, buffalo, leopard and rhinoceros. Stay in the thick of the action, yet from a safe distance. The Serengeti migration is known as one of the “New Seven Wonders of the World” and aptly so. Pictures alone cannot capture the sheer magnificence of the herds traversing across the plains and river with the wind, and predators, on their heels. Each migration loop spans an immense distance of 480km. 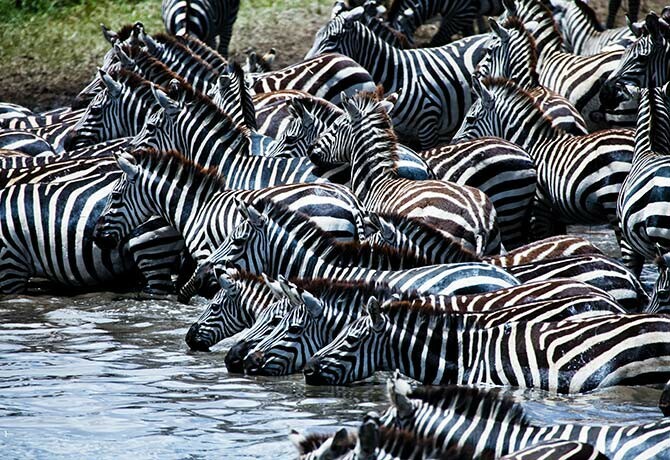 The zebras are usually the first to arrive at the Mara River, dotting the horizon in black and white. The river itself is striking in its own right, with the meanders curving and snaking about the plains. Thus it is quite a sight to behold, and more so for nature lovers. Needless to say, it’s also a great photo opportunity. This huge migration usually begins in July and the herds remain in Kenya until October, calling Tanzania home for the rest of the year. However, with unusually dry weather this year, the wildebeest have begun their journey early. In order to be sure of catching the spectacular river crossing at the Mara River in Kenya, you should plan your trip very soon. Check out the Mara Serena Safari Lodge (www.serenahotels.com/serenamara/default-en.html) to get a good viewing spot from a hill overlooking the river and plains. Alternatively, roam the safari on a jeep with Bushtops Camps (www.bushtopscamps.com) to get up-close and personal for that perfect capture on camera. In the dry season, temperatures are a comfortable average of 20°C but can drop to a low of 13 °C at night, so be sure to pack some warm clothing. Booking a tour seems far easier than independent travel. This is because getting in and out of the safari from airports and nearby cities can be complicated to coordinate and arrange. Communication should not be too much of a hassle, as many locals in both Tanzania and Kenya speak English. Compared to merely visiting caged animals in a zoo, there is far more awe and amazement when one comes face to face with these great beasts in their natural habitat. Moreover, supporting the safaris indirectly provides funds which will go into conservation purposes, ensuring that the animals will continue to thrive in the wild, and to keep their homes safe from human interference. As a final note, going with a travel agency will help to save you the hassle, including of keeping track of where the migrating herd is currently at. Be sure to pack those binoculars and cameras; the safari is waiting for you.